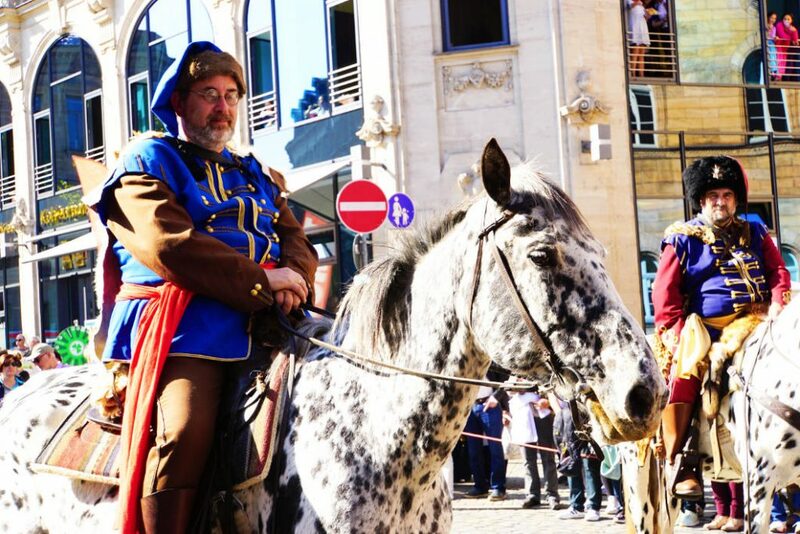 We were already enchanted by the Fürth old town on our way to the meeting point for the walking tour. In glorious sunshine and with summery temperatures small cafés were open for business and people sat outside with their drinks even though it was already October. Once you let your eyes wander down Gustav street you see Art Nouveau buildings, half-timber houses, sandstone houses and houses with slate facades. Most of these buildings are covered by monument protection and reflect the growth and development of the Fürth old town. 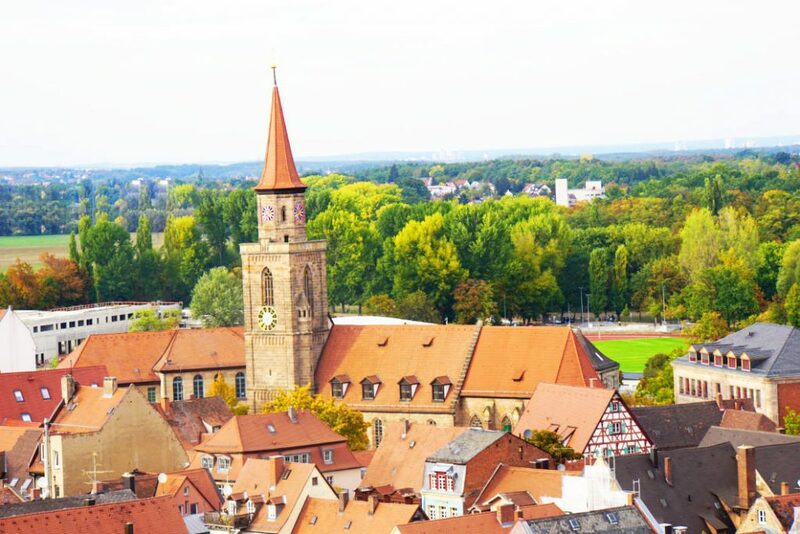 The tour begins at St. Michael’s church and is run throughout the entire year by the tourist information centre of Fürth. The tourist information centre is also the place to inquire about dates, times and prices. The nice weather brought many Fürth explorers to the meeting point. Thankfully, there were also many guides available so that the groups still remained small. The St. Michael’s church is the centre of the old town. The early beginnings of the church date back to 1100. This is when the storage house was built. It is the only building in Fürth that survived the Thirty Year’s War. Later, the 45-meter tower was added. I was surprised that this tower was also used for defence and also as a shelter for the people of Fürth. Right next to the church is the rectory, a very lovely and still intact half-timer house. What is characteristic for the Fürth old town are the many courtyards. With narrow passages that widen towards the back, their shape from atop looks almost like a bag that is lying on the street. The tour visits some of these courtyards. We follow some old train tracks into a former industrial yard. An old chimney from back then still lives here but the buildings were converted into flats and small shops. We’re told a story about each and every yard we visit. They are annecdotes about who lived there or how the yard got its name. Another courtyard used to have agricultural background, in the next one, we find a red half-timer tower and a Jewish ritual bath. Every courtyard has its own characteristics and tells a different piece of the story about life and history in Fürth. Next, the tour leads us to Grüner Markt (Green Market). This used to be the centre of political power in the city. There is a fascinating story behind almost every building and here, too, is a courtyard. This one used to be home to a brewery. The tour comes to an end at the smallest house in Fürth. The 90 minutes of the tour just flew by. We learned a lot about the history of the city, the industry and life in Fürth. I liked how the historical facts weren’t just thrown at us. They were all embedded into stories about locals and about what made the place so special. This was such a fun walking tour and I would really recommend it. After our tour, our guide Frau Schön takes us into the Fürth Town Hall. 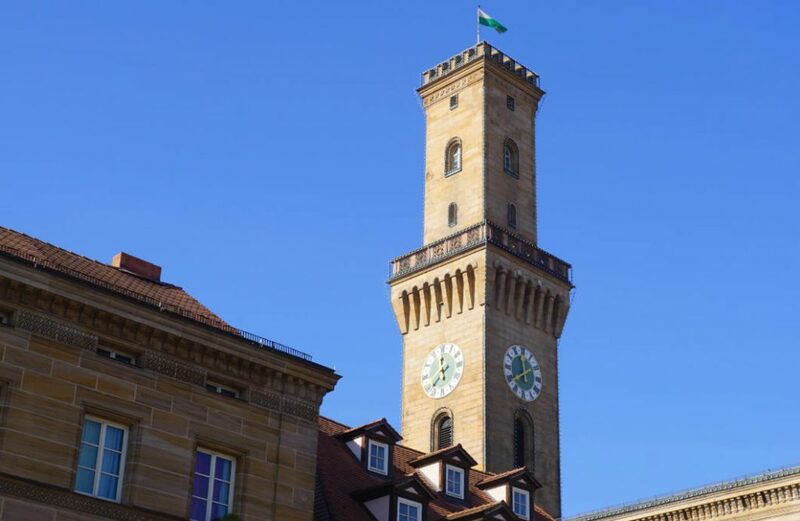 The Fürther Rathaus (Fürth Town Hall) is a landmark of the city and the tallest building in the inner city area. The tower was added some years later and was designed after the Palazzo Vecchio in Florence. About 2000 LEDs light it up at night. As the building’s capacity was no longer sufficient an annexe was added in 1900/01. From the outside, the annexe is nearly indistinguishable from the main building and even inside the only clue where one ends and the other begins is the slightly different floor height of the two buildings. Through heavy, wooden doors we enter a pompous staircase and then the courtyard of the Town Hall. We continue into the part of the building that holds the stairs to the tower. We climb more than 200 stairs, past bells and past the small room that the watchmen of the tower used to sit in looking out for potential fires in the city. Frau Schön tells us that these bells ring at 4 minutes past 12 so that their sound isn’t obscured by the sound of the bells of the surrounding churches. Another characteristic of these bells is that since 2007 they play the melody of „Stairway to Heaven“ by Led Zeppelin. Not the entire song, of course, but certainly some recognisable parts. Once on top of the tower, we get to enjoy the lovely view. 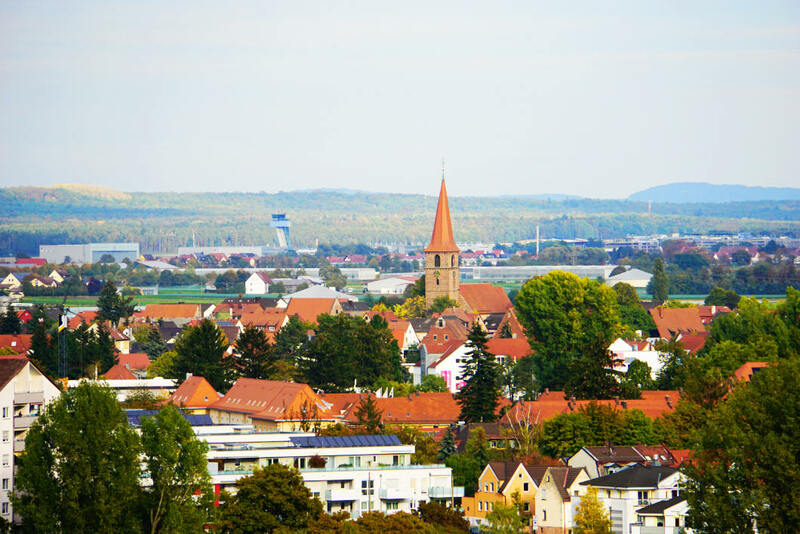 From up here, we can easily see the development of the inner city area of Fürth. Adjacent to the old town there is a less densely developed, more structured part of the city. Next to that is the area that is allocated to the planned city expansion and behind that the new buildings of the suburbs. From up here we also have a premium view of the excitement around the stalls of the parish fair. I love getting to see a city from above. It gets even better when you are given such expert information and tips for other excursions. On our way back through the Town Hall, we briefly stopped by at the assembly room. The assembly room is in the annexe and doesn't look like a room in which people talk politics. The wooden panelling and the coffered ceiling make the room look dignified and classy. 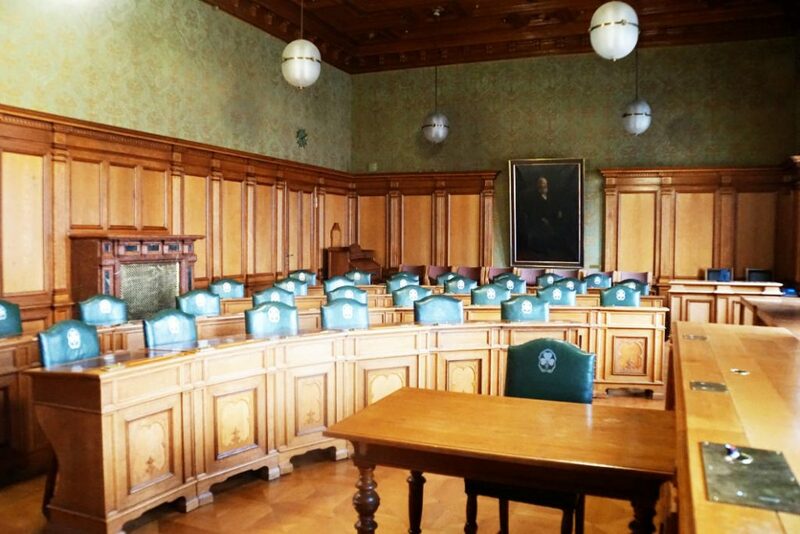 My first association was that this looks more like a courtroom for talking all things law. But political debates just don’t go well with this room. 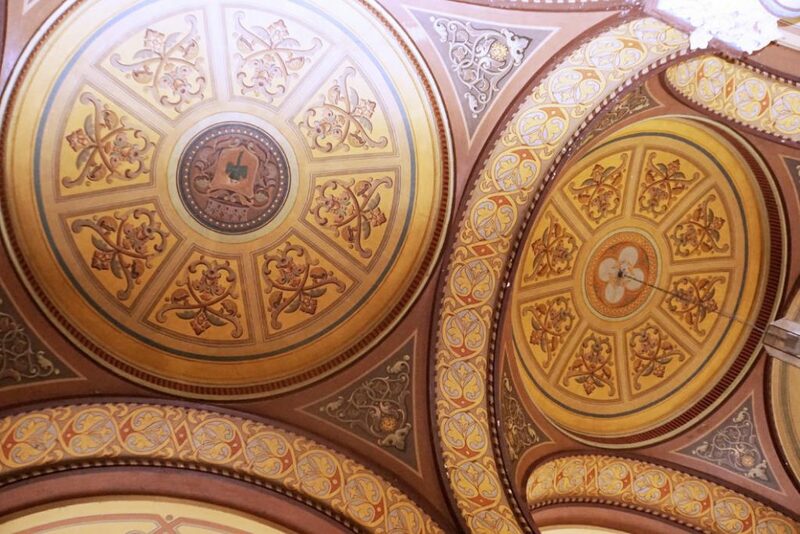 A truly remarkable space! When visiting Fürth on a Sunday, the criminology museum is something not to miss. 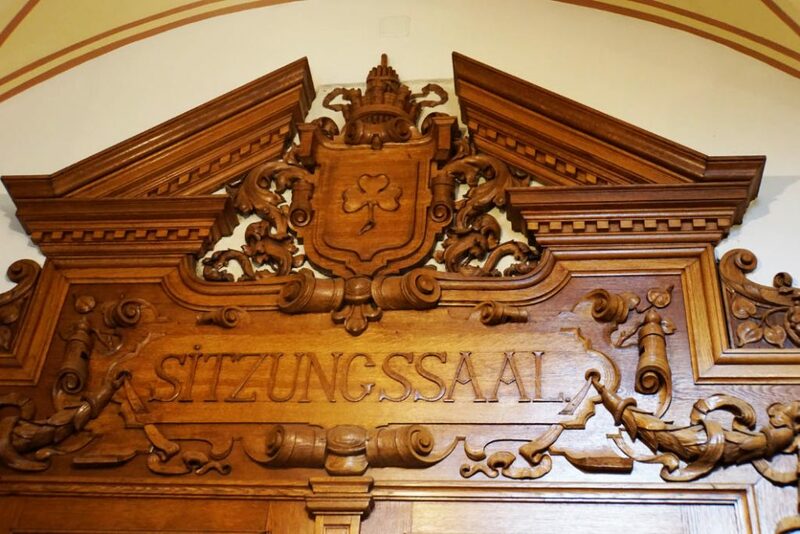 For a few hours in the afternoon, the small museum the Town Hall’s basement opens its doors and presents almost 200 years of Fürth’s criminal history. We were invited to come to the museum and were guided expertly by a retired police officer. It is mostly down to him and his lively personality that we enjoyed the visit to the museum so much. The way he presented the exhibits and talked about his former job made it all very captivating. Thanks a lot! 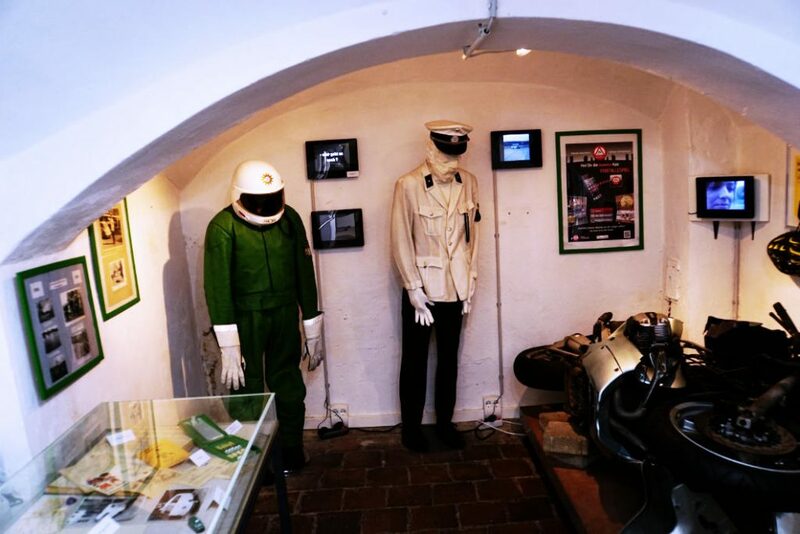 The museum was created a few years ago with the help of former police officers. Some of the exhibits came, in fact, from the personal belongings of former officers and add a local touch to the museum. We start at the section about traffic police officers. It is interesting how for example the alcohol test changed over the years. It becomes apparent how these changes affected the everyday tasks of the officers. We see books in which incidents were documented by hand and I find myself thinking how many aspects of life are easier now because of technology. The different rooms of the museum focus on different aspects. The topics money and forged money, right-wing extremism, substance abuse and weapons are covered. 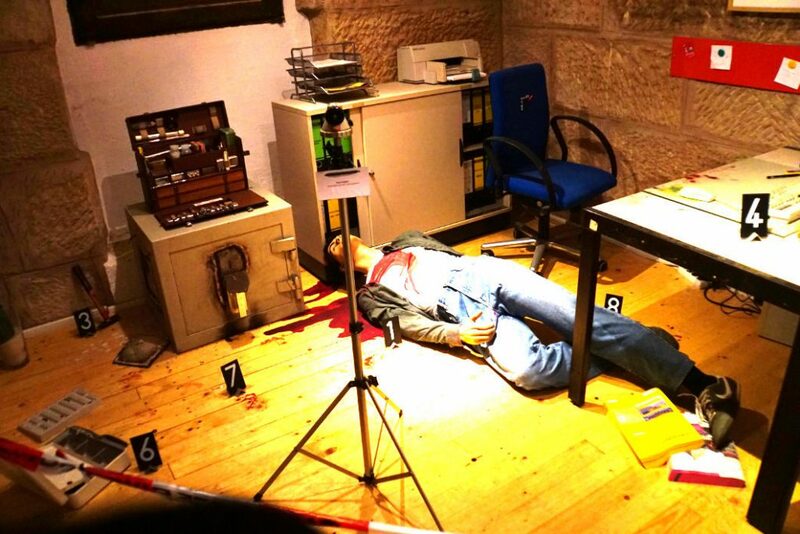 I am fascinated by a model of a crime scene and the work of the forensics team. I also like how some parts of the museum deal with real crimes from in and around Fürth. Mostly very old cases, but there was also one case for example that evoked great empathy within the region for quite some time. The cases are described on info panels and the police work revolving around them is transparently explained alongside them. 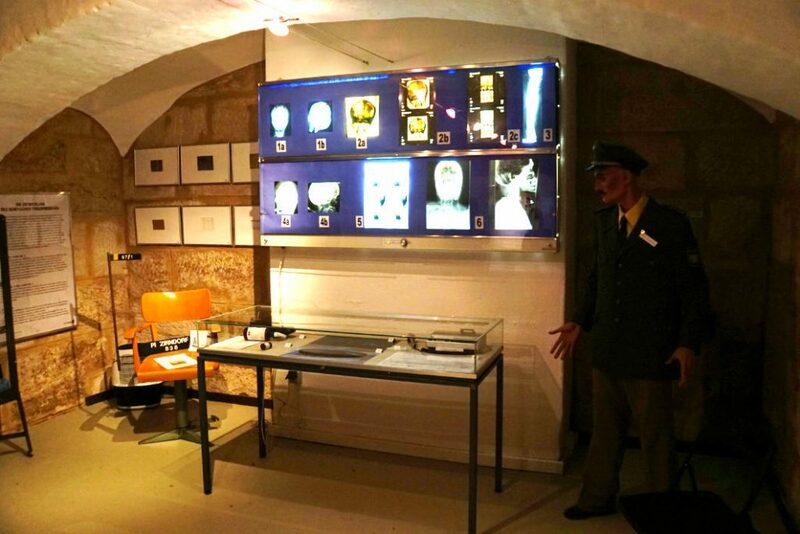 I learned a lot in the criminology museum Fürth and was truly fascinated by the exhibition. The city park is at the northeastern outskirts of Fürth. We escaped the excitement of the parish fair and retreated into the beautiful city park. This is a wonderful place for nice walks and to give the soul a little rest. 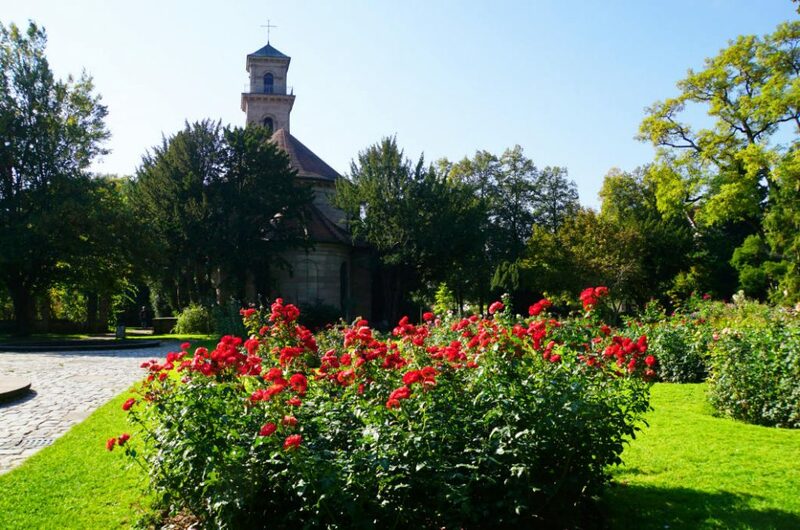 The rose garden at the Auferstehungskirche (Ascension Church) is particularly beautiful. 80 different rose species bloom on 2400 m². Despite the lack of rain over the last few months some of the flowers were still in bloom when e visited and transformed the park into a sea of colours. As it was still very warm even though it was already October, we stopped off at the Milchgaststätte (Milk Guesthouse). What is the city park café today was built in 1951 for the Fürth plant and garden expo by local dairy suppliers. On the facade is a lovely painting that depicts the original milk guesthouse. The building is under monument protection. 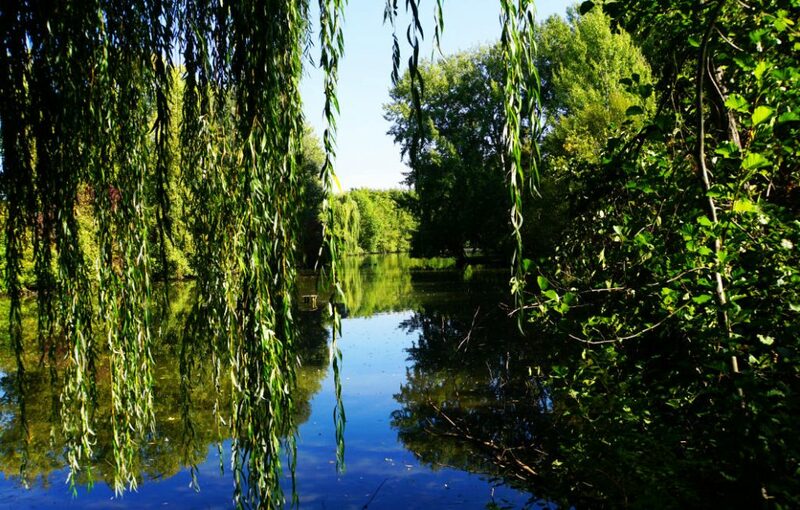 A walk around the pond is also very relaxing. We absolutely enjoyed our time off! Fürth is amazing for going out for drinks. We picked the Grüner Brauhaus (Grüner Brewery) for dinner so that we could enjoy a locally brewed beer with our food. And here is the first tip: Book ahead if your planning on going with more than two people. It was very busy and the attentive staff tried to find a seat for all guests. But bigger groups ended up having to wait until something became available. I ordered a typically franconian dish: „Schäufele mit Kartoffelkloß und Bayrischkraut“ (Piece of the shoulder with a potato dumpling and coleslaw). To be honest, I had no idea what a Schäufele was and judging by the look on the waiters face that dish isn’t ordered all that often. The taste, however, was sensational. The meat was so tender and melted in the mouth. With it we had regional, cloudy beer on tap. The evening was perfect. Patrick chose something off the daily menu and had a beautiful roast boar with potato dumpling. The hearty dishes were very much to our taste and the beer was exceptionally smooth. A great finale to our day! 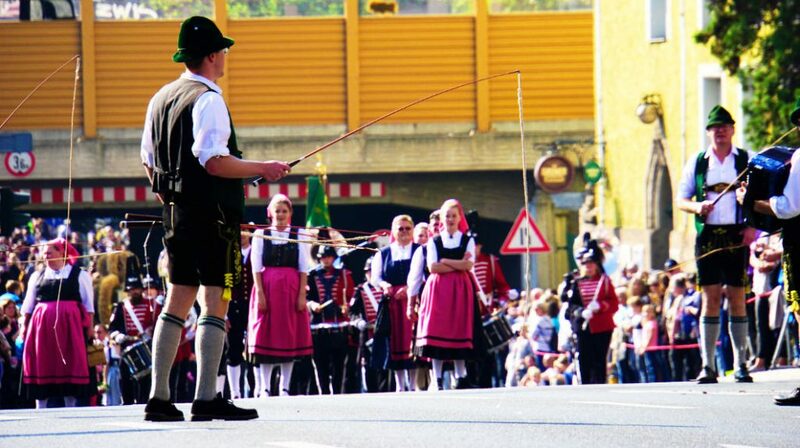 When you get to Fürth, Michaelis Parish Fair will be on. That was one of the first pieces of information we got about Fürth. Okay, parish fair. What is that? 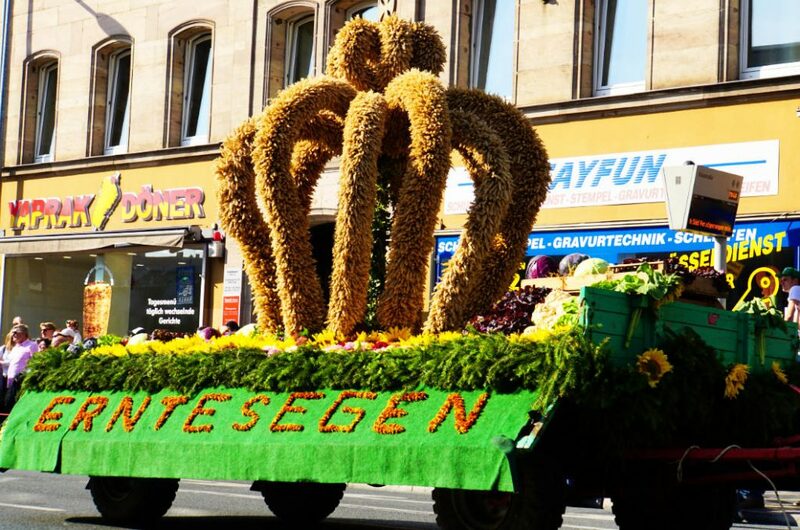 Fürth celebrates the so-called „Fädder Körwa“ annually. 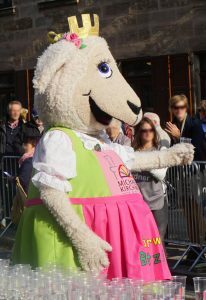 It is a mix of parish fair and market with stalls, shops, food and rides. Bar and restaurant owners from in and around Fürth sell beer, Federweißer (wine) and Schäufele (piece of the shoulder). And then there is a Thanksgiving parade. That is what I was able to find out. But what waited for us in Fürth was next level. When I hear street fair I think of one street with some stalls and maybe rides. Far from it! Starting at the central station and covering multiple blocks was a wild mixture of food, rides and shopping that went through the entire inner city. The whole event covers 42000 m² and absolutely everyone will find something to enjoy. As the day went on, more and more visitors came to the street fair and it became very busy. Wedged in between people we walked from stall to stall in the early hours of the evening. In addition to that, the city also offers some guided tours, live music, a street run and also shops remain open on Sunday. It all peaks with the Thanksgiving parade. The history of the Thanksgiving parade starts around 1815. Many harvests didn’t return nearly enough food for everyone which resulted in a famine. Despite all that, in the summer of 1817, the very few and sickly seeds that remained grew into a rich harvest. 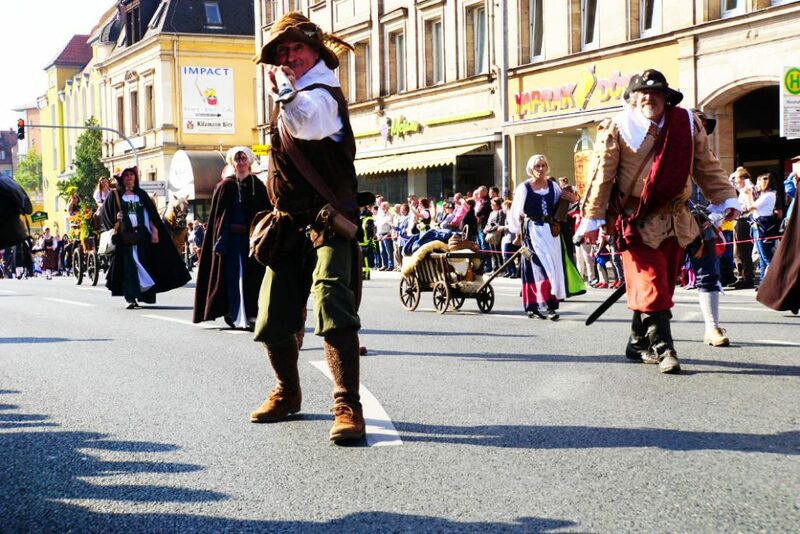 The people of Fürth were enthused and celebrated with a Thanksgiving parade. 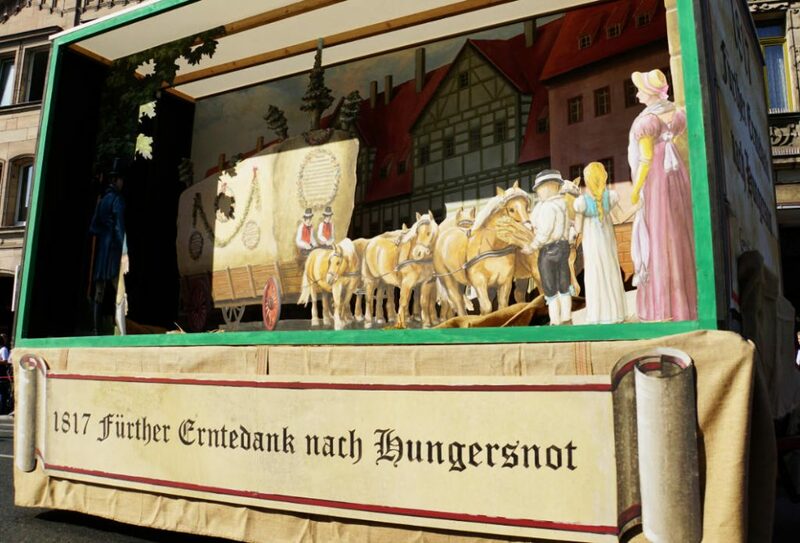 A Thanksgiving float was driven through the city for the parish fair. Since then there is a Thanksgiving parade every year. Over 90 groups and marching bands created a colourful and diverse parade that was moving through the city in the morning. I had never seen anything like that before. I absolutely fell in love with the traditional clothing. I saw so many beautiful garments. And the men with their leather trousers and their whips were my personal highlight of the parade. The Thanksgiving parade has left a lasting memory in my head. We got to visit the criminology museum and the Town Hall free of charge as part of a research trip. That also allowed us to join the walking tour for free. This article exclusively reflects our own opinion and was written independently.